Western pa is not known for its incredible duck hunting but that doesnt mean there are no ducks. I took the kayak on a 4 hour float down the river on our opening day, beautiful morning to drink coffee in solitude. I would have been happy just seeing a duck so I was thrilled to take a few home. Got a drake and hen wood duck and a merganser. Got some shooting in and saw a pile of birds. Im hooked big time now. Im going to change my choke/shell combo and start floating for ducks and geese a lot more. This goes to show that just because you have never done something doesnt mean you cant. Nice work! Floating for ducks is a hoot! I've wanted to try that for a few years now, but my kayak is mango orange. Should have thought that thru a bit more before the purchase! 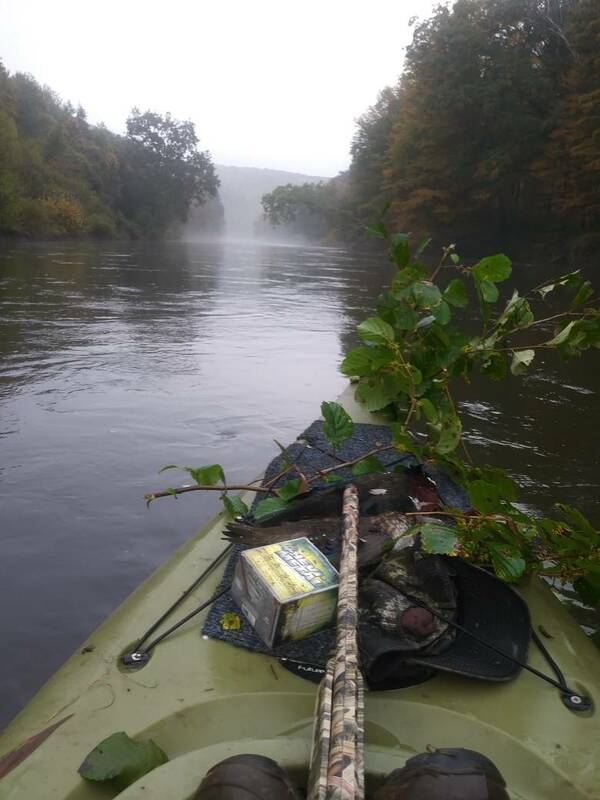 Are there any slow moving spots where you could set up a few decoys and call at passing birds flying down the river channel? Those woodies are the best eating waterfowl to be had. I jump a few off of a little tank almost every time I make my way into one of my deer stands. I really want a drake wood duck for the wall so I'm planning to bring a shotgun in with me as soon as the season opens up down here in TX. I met one other hunter, he was along the bank with a dog. The river is narrow enough and has a creek feeding it where he was that they flyby and land quite often. I could use some decoys at the big slow spots. The trick is to see the slow water before you get to it and get ready. I jumped several from behind large rocks and blowdowns. The drake woodies are beautiful. The next one I get I plan on mounting also. Good for you!!! Never know till you go. and I camo kayaks for here in the Mobile River Delta. 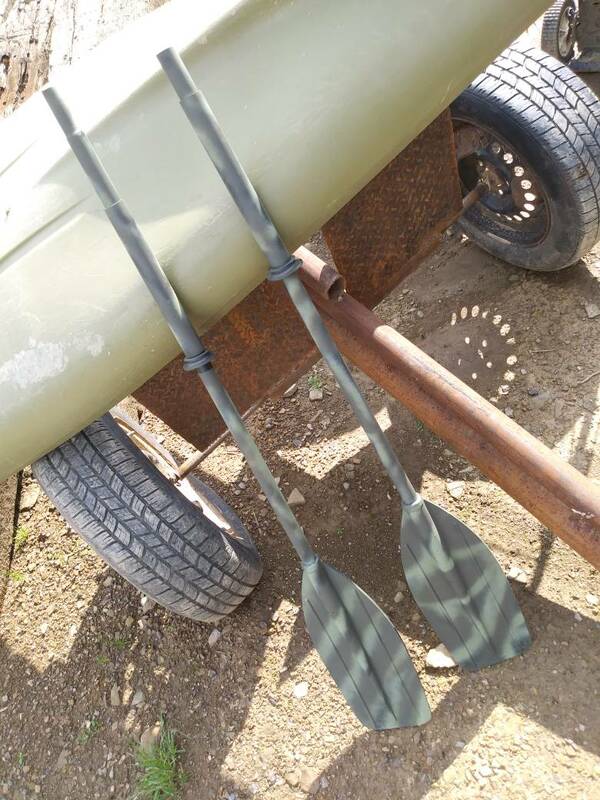 Also I spraypainted some paddles camo. If you take your time you could do a whole kayak and make it look real good. That merganser will pair well with a side of green persimmons. Send that Merganser to the Taxi. Got home from work early, walked down to the swamp about a mile from my house. Havent been into it where the beaver ponds are in years. Jumped about 15 more wood ducks amd nailed 2. Hit a 3rd but could find it, must have swam off through the marsh. Got a dove on the walk down too. Too much fun! Ya I saw the one I hit but then it dove, stood there for 10 minutes and never even saw another ripple. Blew my mind. When they dive they will bite down on grass to keep their bodies submerged. Sometimes they die like that with their bills still clamped down tight to that grass. I just started hunting ducks this year too, it's great! I've lost one bird this year. Hunting beaver ponds, shot down two mallards. Retrieve the close one, go to get #2 but it's still kicking. Hops over to a smaller pond, maybe 15 yards across, sees me and dives underwater. I waited 40 min, never came back up. Must be partying with Loch Ness down there??? First time experience is the most exciting one. You must had a great time. Wait til you get the opportunity to have a couple hundred greenheads settle down into a flooded timber hole and get their feet wet. I cannot believe this damn weather pushed everything out of ND early again this year. I haven't hunted snowy corn fields for Mallards in a long time. It's an addiction enjoy it sir! Welcome to another addiction. I started by float hunting. Ive hunted a lot throughout the us from fields,. to pit blinds, mallards in the timber and divers on the coast. Honestly if I had to only do one I could live with floating them up. Nothing like floating down a small creek seeing deer and turkeys and then when you surprise those ducks and they flush. If you notice they are always close to a certain spot when floating maybe get there before daylight and throw out a few decoys. Good luck with the quest.